China dominates the global art and antiques market as of last year, said a report published Friday ahead of the launch of the European Fine Art Fair in the Netherlands. 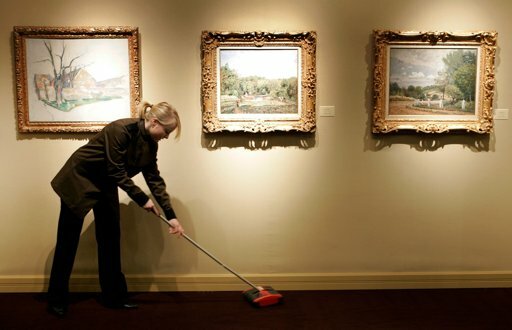 An employee cleans the carpet before the opening of the TEFAF (The European Fine Art Foundation) Art Fair in Maastricht in 2008. Published by organisers of the world's biggest antiques fair, to open to collectors in the southern city of Maastricht, the report said China now claims a 30 percent share of the worldwide market. "China overtook the United States for the first time in 2011 to become the largest arts and antiques market worldwide," said the paper. It said the findings were based on "both auction and dealer sales". The US was pushed into second place with a share of 29 percent, as art sales worldwide jumped by seven percent from the previous year to a staggering 46.1 billion euros ($ 60.3 billion) in 2011. Britain, overtaken by China in 2010, was third with 22 percent, while France came fourth with six percent, said the report "The International Art Market in 2011: Observations on the art trade over 25 years". The report, compiled by Claire McAndrew, a cultural economist specialising in the fine and decorative art market, called the development "perhaps one of the most fundamental and important changes in the last 50 years". "The dominance of the Chinese market has been driven by expanding wealth, strong domestic supply and the investive drive of Chinese art buyers." The arts and antiques market recovered significantly over the past two years, McAndrew wrote, as the global economy slowly recovered from the 2008-09 crisis, which had created a "more cautious buying climate". Chinese investors however saw art as a significant substitute for ailing property and stock markets, said McAndrew. Some 260 exhibitors from 18 countries will take part in this year's 25th fair, to run until March 25, putting some 30,000 works up for sale. Among them will be sculptor Henry Moore's 1977 black granite creation "Reclining Figure Curved", with an estimated value of 35 million dollars (26.65 million euros).